Comedy and romantic movies have always been the go-to genre in Pollywood. There has been a significant increase in the stories based on period dramas and biopics as well. However, there are hardly any films reflecting the dilemmas and problems faced by the society. Punjab’s drug issue has already grabbed the attention of the Bollywood. Now is the high time to view it through the eyes of an insider. ‘Bhagat Singh Di Udeek’ brings about that perspective on the screens.The movie stars newcomer actor Arsh Chawla in the lead role and is directed by the debutant director Shivamm Sharma. The story of Bhagat Singh di Udeek is written by Babbar Gill, who has also written the screenplay and dialogues of the film. The film will also mark the first performances of actresses Khushi Malhotra and Surbhi Singla. 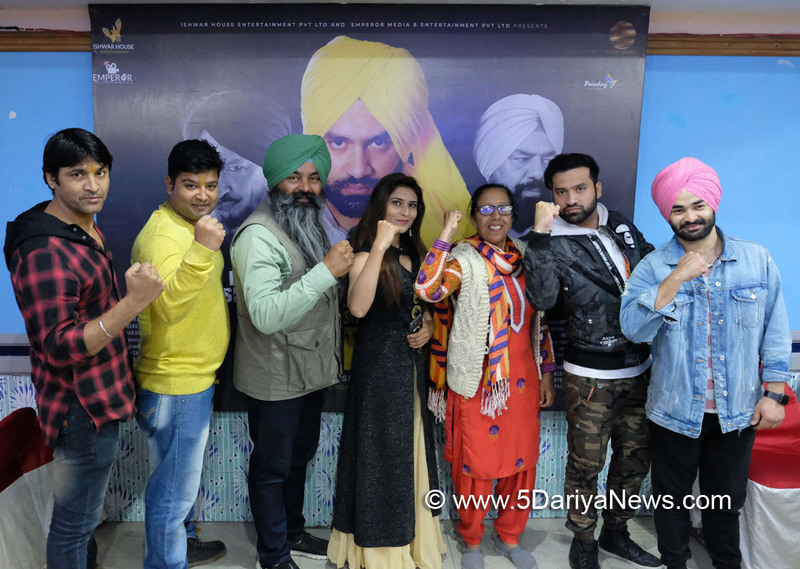 The prominent names of Punjabi industry like BN Sharma, Malkit Rauni, Sardar Sohi, Gurpreet Bhangu, Jasev Maan, Gurmeet Daman, etc are also associated with the film. The movie is produced by Virendra Singh Kalra and Avijit Singh Kalra in collaboration with Executive producer Dilbag Chawla. The music of the film is composed by DJ Narender and Babbar Gill has penned the lyrics of the songs. Music is released under the Yellow Music banner. This film is beautifully shot by DOP Vishwanath Prajapati.Film’s protagonist, Arsh Chawla, talked about his role and said, “I play Fateh, the man who sets out to avenge his sister. He is the man who stands against the evils. He is not waiting for someone else to fight on his behalf. Shivamm is a visionary director, he knows his craft well. Working with him on this project has not only helped me professionally but also personally because I have learned to take responsibilities for changing the things, at least around me, keeping aside my fears.”The young and dynamic Director Shivamm Sharma also shared his vision about Udeek, saying, “This film has taken a lot of toils. I have seen Bollywood movies who have talked about the drug menace in Punjab. This goes a step ahead and will tell the youth to take a stand and bring about a revolution to end our issues. Arsh is as new to the industry as me. It was a learning experience for both of us… More like a revelation for both of us about our potentials.”The producers of the film, Virendra Singh Kalra and Avijit Singh Kalra, said, “Udeek talks about that mindset of our society where we are waiting for a leader to make a change. But we must realize that we are the youth who have that power. Just like young Bhagat Singh who had set out to free India, youngsters today need to take up matters in their own hands.”The movie ’Bhagat Singh Di Udeek’ is an Ishwar House Entertainment and Emperor Media & Entertainment presentation and is all set to hit the theatres on 2nd February 2018.